The words of Mi chamocha are taken from the Song at the Sea (Shirat Hayam) in Exodus 15, and are included in every weekday and Shabbat service. This setting is based on the Ahavah rabbah (freygish) mode, a weekday prayer mode that has been a strand of Jewish liturgical tradition for many centuries. This setting is so celebratory, my feeling is that it can work wonderfully on Shabbat, even though it is written in a weekday mode! The 2nd century Rabbis taught that repetition of words is never arbitrary, and must be studied for the meaning that they add. With the repetition of mi kamocha in the text near the start, it seemed appropriate to repeat the opening melody. But with the next words attempting to describe the indescribability of God, the melody also need to take a new direction. The words ending the second line, nedar bakodesh nora t’hilot oseh fele, contain a 3-part idea, climbing rhetorically – glorious in holiness, awesome in splendour, doing wonders. The music (bb 6-9) embodies the 3-part idea with a 3-part stepwise upward movement to oseh fele. I was delighted that the resulting melody for the verse was 10 bars. This meant the tune could carry the important number 10 in it. As 10 kabbalistically encapsulates the 10 ‘attributes’ of God, it therefore symbolically represents the totality of God, who cannot be described except by saying “who is like You?” (to which the answer would be “no one”). When the 3-step musical sequence returns for verse 2 (bb 24-27), because there are fewer words to set, the rhythmic character changes; I imagine this as the advancing waters in the Sea of Reeds. In the third verse, the 3 steps (bb 44-47) take us through three distinct ideas: praising, acknowledging God’s sovereignty, and proclaiming. 1. Who is like You among the gods, my Lord? My Lord will reign for ever and ever! 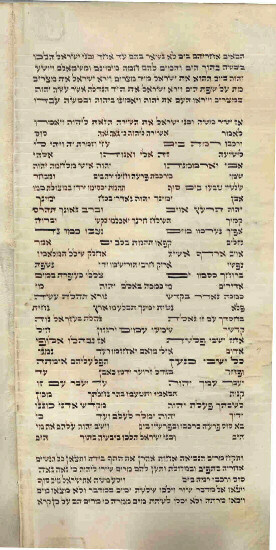 One strand of Jewish tradition holds that words that are not repeated in the Tanach (Bible) should not be repeated in liturgy (and therefore presumably not in song either). However, two ideas encourage me to innovate in prayer and song. First, Mi chamocha itself was a ‘new song’ and many psalms tell us to ‘sing a new song’. Second, the midrash (commentary) in the Tosefta (Sotah 6:1) suggests that Moses sang each line, and the people responded antiphonally each time with “I will sing to the Lord”. This setting picks up on this midrash, but uses another line (Adonai yimloch l’olam va’ed) from the song. With the intention to intensify our kavanah and prayer energy, I multiplied the repetitions so that every word of this refrain is repeated immediately it occurs. There is one other detail to note about this setting. After the second verse, the 2nd time round of the refrain extends the refrain we heard after the 1st verse; this is further extended in the 2nd time round of the refrain after the 3rd verse. This is for two reasons. First, the midrash mentioned earlier also suggests another interpretation in which the people didn’t simply copy Moses their leader, nor repeat the same verbal refrain, but offered their own creative response in a collaboration of equals. Second, the extensions on each repeat are on the word l’olam – forever -, and the constant variation of the refrain keeps us mentally alert to what we are singing about! The refrains at A, B and C (the end of each chorus) all have different endings. Observe all repeats and the 2/4 bar near the end.